← Repeal of Hunting Ban in 2013? 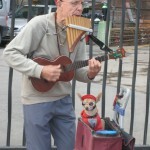 The Grumpy Vegan couldn’t help but notice this Chihuahua and the busker in Barcelona. 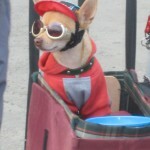 The Chihuahua appeared to enjoy the attention. This entry was posted in The Grumpy Vegan Life and tagged Animals in Entertainment, Companion Animals. Bookmark the permalink. Looks like degradation to me.